To make an appointment, please contact Julia or Benedict on (03) 9853 9525. 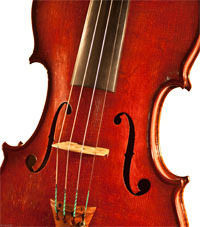 A finely crafted violin with a two piece back and medium flame. The ribs contain finer figuring and match the scroll. The top is medium grained spruce. The instrument is currently set up with Evah Pirazzi strings. Daniele attended the International School of Violin Making of Cremona under the guidance of the Masters Massimo Negroni, Ernesto Vaia and Vincenzo Bissolotti. During that period he graduated in the Course of Construction of Guitars taken by Master Charles Raspagni in Vignate (MI). He then moved to Paris for three years to learn restoration techniques and set-up. 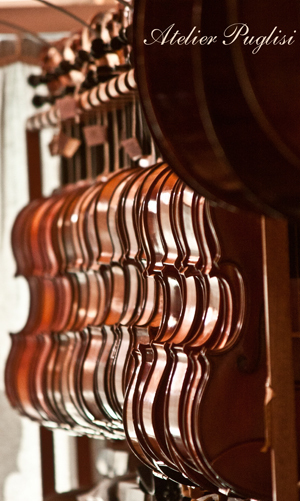 There, Ciaccio worked for the famous shop Vassiliev, run by Bernard and Pierre Sabatier Barthel, and Latin Liutherie, run by Gilles Chancereul maker, acquiring familiarity with the style of French violin making. Daniele then moved to the United States where work Hillmusic Shop (North Carolina) with R. Nowell e Jennifer Creadick. Nowell and Jennifer Creadick. Then working in San Francisco in the laboratory of Frank Pass (friend and student of Ferdinand Sacconi) where repaired important Italian instruments (Gragnani, Sturgeons, Sannino, Postiglione, JB Ceruti Scarampella, etc. ...). Ciaccio returned to Cremona in 1997 and devoted himself exclusively to the construction of new tools and models based on copies of the Italian masters. He collaborate with Charles Church (historical and luthier) in Milan, where he learnt the building and set-up of baroque instruments (viola da gamba, violin, cello). 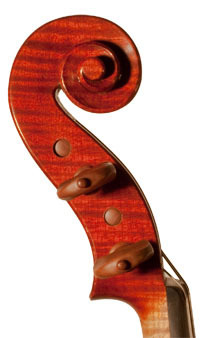 Later he moved to Brisbane, Australia on Simmers Violin Makers managed by the restorer John Simmers, where restoration tools most beautiful of Queensland (Bernardel, Rocca, Sacconi Fagnola, Klotz, Poggi, etc. ...). Then moved to Sydney to work at The Violinery run by famous violinist Charmian Gadd for which his violin restoration staff M. Goffriller. He returned to Italy for two years working in Milan for an estimated restorers Fantova Frederick and Julia De Lucca, where he has had the opportunity to refine my skills. For his last work experience, he spent 2 more years in Cremona, in the workshop of Eric Blot. Finally, in 2008 he opened his workshop in the center of Cremona, Via F. Cavallotti n°13. U No. 13.